Hotline slot is a standart five reel, three row and a 30 paylines video slot provided by NetEnt software platform. 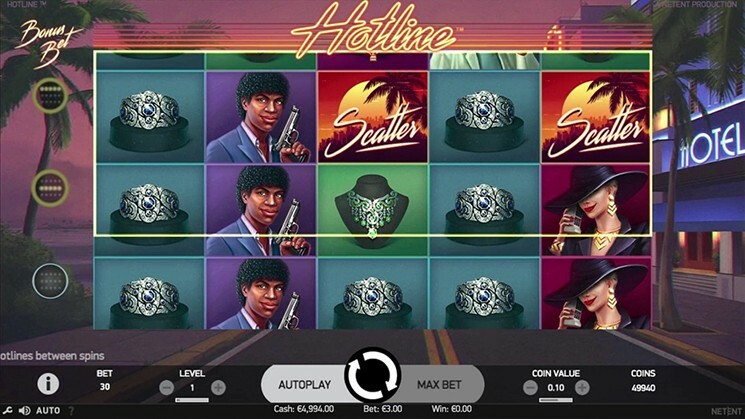 Video slot takes its inspiration from famous 80’s TV show “Miami Vice”. Slot have overall a really nice 80’s vibe with appropriate for the era music in the background. As usual there are different kind of payment symbols that appear on the reels. Low value symbols includes different colored jewelry, Red Crown, Green Necklace and Blue Bracelet. High value symbols are three main characters of the show. Before investing real money players can try Hotline Slot for free, or visit any NetEnt casino such as: Jester Jackpots Casino, PlaySunny Casino, 1xSlots Casino and others to play with real money and win. Before you go back in time to the 80’s Miami, your bets need to placed. “Coin Value” button as name suggests is for setting value of the coin and denominations varies from 0.1 to 1. Using “Level” button players can choose amount of coin per line. To start game with already maximum bet level just click “Max Bet”. “Autoplay” will give you an option to select number of the spins and game will play automatically, while “Spin” starts the game. Game also features Wild and a Scatter symbols as well. Wild symbol is a licence plate rear of a vehicle and you can not miss a Scatter symbol. Hotline Bonus Bet feature, give you chance to increase winning with Expanding Wilds and Re-Spins features. Every row is a Hotline which players can activate or deactivate. If a Wild symbol lands on the active Hotline row, you will trigger Expanding Wild and a Re-Spin feature. After feature is activated Wilds will cover whole reel awarding you with big wins. To activate Free Spins feature, 3 Scatter symbols need to land on the 1, 3 and 5 reels. After the feature is triggered you will be awarded with 7 bonus spins.